Kolkata the capital of West Bengal is the nerve centre of intellectual and human values having given birth to numerous modern movements in literature, art, cinema, theatre, science, politics and industry.Kolkata is regarded as the cultural capital of India for her immense contribution in these fields.Kolkata is also the hub centre of West Bengal. The Kolkata port is one of the major ports of the country. Kolkata in the Ganges delta is located in the eastern part of India at 22°82'N latitude and 88°20'E longitude. The Sundarbans delta which is located at a distance of 154 km to the south of Kolkata separates the city from the Bay of Bengal. 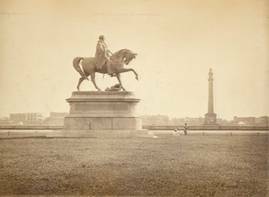 Kolkata was founded more than 300 years ago out of 3 villages namely Sutanuti, Gobindpur and Kolikata.After London; Kolkata was the British empires second city of pride. 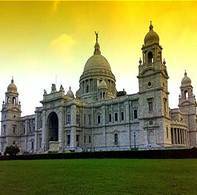 Once the capital of the British India, the capital of undivided Bengal and the capital of West Bengal since independence.Kolkata retains the aura of days long gone weaving the glorious past, the fascinating present and integrating a mix up of Indian and colonial heritages. Durga Puja is by far the most popular festival of Kolkata.When her invocation begins there is autumn ambience in the air;fields look emerald green, seeds are sowed and every heart is filled with expectation of her joyous home coming. The other religious festivals include Kali Pooja, Diwali, Rathajatra, Holi, Id, Muharram, Christmas and Sraswathi pooja. 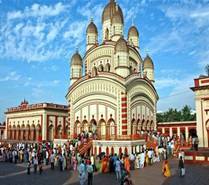 Kali Temple - This temple of Kalighat rebuilt in 1809 an important shrine of Hindu Shakthi worship. This temple was built in 1847 associated with Lord Ramakrishna Paramahansa Deva, 3km to the south of Kamarpukar, engineering who had been an exponent of integration among different religions. Nakhoda Mosque - This mosque modelled on Akbar Tomb in Sikandra, distinctively marked for its unique architecture and huge capacity to accommodate nearly 10000 people. Parswanth Jain Temple - This temple is known for its architecture and spiritual environment. St.Johns Church - This church located in the town of Kolkata was built in 1878 with Grecian columns. 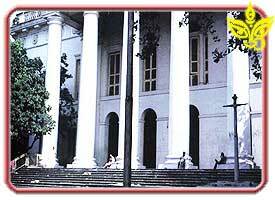 Armenian Church - This was built in 1764, which is the oldest place of Christian worship in Kolkata. St.Pauls Cathedral - This cathedral was consecrated in 1847 which is famous for its gothic style of architecture. This was built in 1921 on the lines of Taj Mahal in memory of Queen Victoria, now housing valuable paintings, manuscripts and other objects of historic value, museum and art gallery. 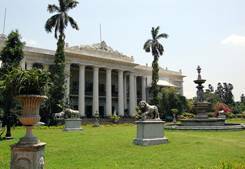 This was built in 1803, to be used as the residence of Governor General of India, presently used as the residence of Governor of West Bengal, remarkable for wonderful architecture and collection of rare works of art. This was built in 1813, in Doric style of architecture, now housing the first high - tech story telling museum in the country. This was built in 1887 in Italian style of architecture, housing the largest collections in the country. This is one of the massive British citadels built in 1773, still in use retaining the well guarded grandeur. This was built by the British government in 1828; renamed Shahid Minar in 1969 is an old witness to great events in history and politics. This was initially Vice Regal house now housing the biggest library in the country with the rarest collection of books. This is situated at Jorasanko; birth place of Rabindranath Tagore is now housing a centre for Indian Classical Fine Arts. This palace was built in 1840, famous for its marble walls, pillars, mirrors and beautiful architecture presently housing a museum. 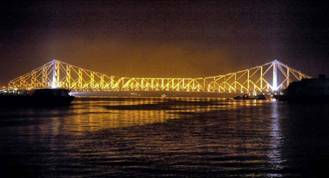 This is popularly called as Howrah Bridge, a huge cantilever bridge strung on two 196 feet high pillars connecting Kolkata with Howrah and still framing the skyline of the riverfront along with the newly built Vidyasagar Setu, the latest style of cable stayed bridge. This is one of the largest in the world, offering regular shows on different aspects of space sciences. 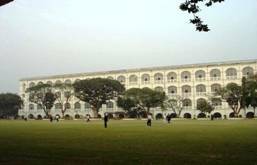 This houses Satyajit Ray film archive and cinema halls with a number of auditoria and exhibition centres namely Academy of Fine Arts,Rabindra Sadan, Bangla Academy etc. forming a large cultural complex and attracting people interested in film, music and other facets of art and architecture. 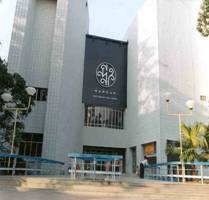 This is a sprawling convention centre also famous for space theatres, museum and ropeway. This is one of the sprawling gardens with a bandstand and a beautiful Burmese pagoda. This river front comprising outram ghat and the newly set up Millenium park, offering cool breeze of the river, pleasant walks and visual delight. This is at Allipur having a vast collection of animals, birds, snakes and reptiles and this attract a major tourist crowd especially in the months of winter. This is a popular amusement park offering the modern sports opportunities. Shopping complex includes those at New Market, Shyambazar, Hatibagan, Burrabazar, Sealdah, Park Street, Russell Street, Gariahat, Dakshinpan, Central Cottage city emporium and Bow bazaar. This provides very good shopping items including handlooms, jewelery, leather goods, clothes and garments. The other main shopping area includes Forum of Elgin Road and Charnok city at Salt Lake. 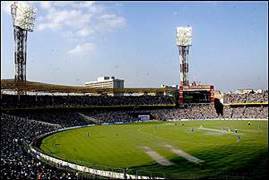 How To Reach Chowringhee Market ? Kolkata can be easily accessed by flights for there are number of domestic airlines that connect Kolkata with other major cities of India like Ahmedabad, Bagdogra, Bangalore, Bhubaneswar, Chennai, Delhi, Guwahati, Hyderabad, Jaipur, Lucknow, Mumbai, and Port Blair. The airport is located in Dumdum. The city has two major railway stations-one at Howrah and the other one at Sealdah.There are train services to the rest of the country from Kolkata. Super-fast trains such as Rajdhani Express and Shatabdi Express connect the city to Delhi and nearby cities such as Bokaro and Rourkela. Coromandel Express connects Kolkata to the southern regions of the country. West Bengal state buses connect all parts of the state with Kolkata. Deluxe and A/C luxury buses are available from Kolkata to various cities in the state and neighboring states.